Sebaceous glands are small sebum-secreting glands connected to hair follicles in the skin. Sebaceous gland tumours could be benign such as sebaceous hyperplasia and sebaceous gland adenomas, or malignant such as sebaceous carcinoma. Sebaceous carcinoma is a rare, highly aggressive and lethal malignancy with a predilection for the periocular region. Most commonly, it involves meibomian glands of eyelids, leading to the terminology meibomian gland carcinoma. Other sebaceous gland-containing structures such as the caruncle, the glands of Zeis, and the eyebrows could be involved. 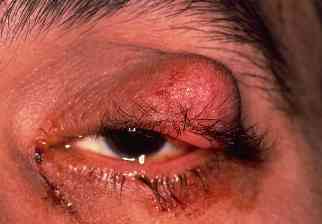 It requires a high index of suspicion to diagnose sebaceous cell carcinoma of the eyelid. The upper eyelid margins of elderly women in their seventies are principally involved. Sebaceous cell carcinoma are notorious in masquerading as innocuous lesions like a chalazion or chronic blepharitis. It is locally invasive and readily spreads to regional lymph nodes. 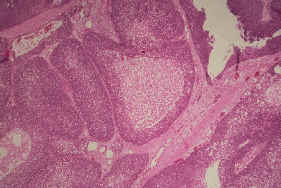 Histologic intraepithelial spread could be misdiagnosed as epithelial dysplasia or carcinoma in situ. Foamy cytoplasm is characteristic of sebaceous carcinoma and helps distinguish it from conjunctival or cutaneous squamous cell carcinoma. Histologically, it is indistinguishable from basal cell carcinoma, squamous carcinoma or Merkel cell tumour. Only fresh frozen or formalin-fixed tissue unexposed to alcohol and positively stained by special stains such as Oil Red O confirms a diagnosis of sebaceous carcinoma. Nodular variety presents as a painless, discrete, hard, immobile, yellowish nodule commonly located in the upper tarsal plate. It usually has an insidious onset. 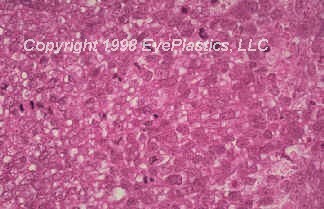 Spreading variety leads to diffuse intraepithelial infiltration of the lid skin causing diffuse thickening of lid margin, loss of eyelashes, and resembles chronic blepharoconjunctivitis. Both history and clinical features of this aggressive and lethal tumour are highly variable. More than half of sebaceous cell carcinomas resemble benign inflammatory conditions such as chalazion, blepharoconjunctivitis, keratitis or other malignant and benign skin lesions, often leading to a misdiagnosis or a missed diagnosis. Hence, any unilateral blepharoconjunctivitis with loss of eyelashes, thickening of the lid margin and that fails to respond to the treatment requires a biopsy. The incidence of metastasis (41%) is also alarming. It spreads by continuous growth, lymphatic spread or haematogenous spread. Small, erythematous or yellowish, firm, deep-seated, slowly enlarging nodule. Upper eyelid involvement 2 to 3 times more common than lower eyelid. Often mistaken for blepharoconjunctivitis and other common eye conditions. Biopsy establishes the diagnosis by the presence of numerous sebaceous elements with mitotic figures staining positive for fat with oil red O stain. Multiple conjunctival map biopsies could be performed to stage the disease. Lymph node biopsy could be needed to rule out distant metastasis. The aim of treatment is complete removal of the malignant lesion to prevent local or systemic spread. Different treatment modalities include local excision, orbital exenteration, radical neck dissection, radiation, or chemotherapy depending on the stage of the tumour at the time of presentation. Radical surgical excision with frozen section control by either a standard method or Mohs micrographic surgery constitutes the most common and effective treatment modality. There is 30% recurrence after surgical removal. Radiation therapy is usually avoided because of serious adverse effects such as dry eye, lid atrophy, skin necrosis, lash loss, lid telangiectasia, ectropion, epiphora, keratopathy and cataract. The overall mortality rate in sebaceous cell carcinoma is 5-10%, which is mainly due to misdiagnosis and delay in treatment initiation. Take a close look at this....Now go back and look at the chalazion. Always consider sebaceous cell carcinoma in the differential of recurring chalazion. It could mimic Chalazion or chronic blepharoconjunctivitis.